Distinguished Professor Ramsés H. Mena from the National Autonomous University of Mexico joins Bath as a 2018-2019 Global Chair. The University is honoured to welcome Ramsés H. Mena, Professor of Statistics at the Institute of Applied Mathematics (IIMAS), the National Autonomous University of Mexico (UNAM) as a Global Chair visiting professor. Hosted by the Department of Mathematical Sciences and Institute for Mathematical Innovation, Professor Mena is a University of Bath Global Chair for the 2018 – 2019 academic year. His appointment has been funded by the International Relations Office’s Global Chair scheme, a flagship programme designed to attract distinguished, globally renowned scholars to engage in high-profile research activities at Bath. 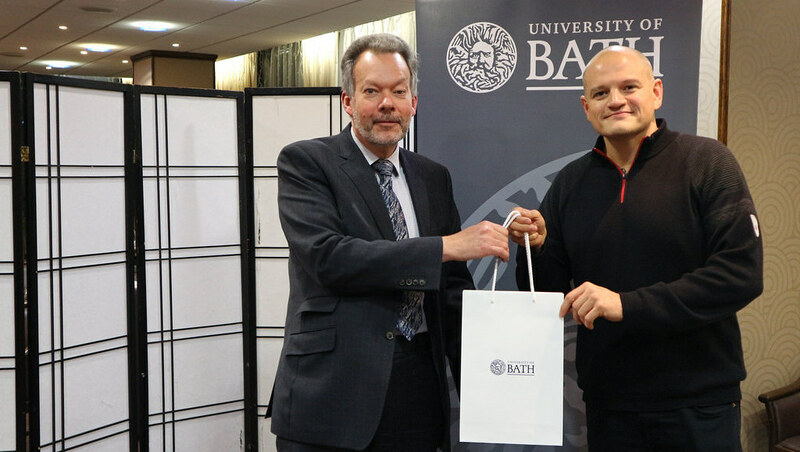 Professor Mena gained his PhD from the University of Bath in 2003 and has maintained close links with the University ever since, primarily through the Bath-UNAM-CIMAT (BUC) research platform, of which he is an executive committee member. His research interests are focused in the areas of Bayesian Nonparametrics, Applied Stochastic Processes, Time Series Analysis, Species Sampling Models and Simulation Methods. Professor Jeremy Bradshaw, Pro-Vice-Chancellor (International and Doctoral), and colleagues from across the University welcomed Professor Mena on Monday as he arrived in Bath for the first of several Global Chair visits. Bath's Global Chair scheme has been incredibly successful in providing the University with the unique opportunity to welcome a diverse array of distinguished academics to our campus. Today, we are particularly delighted to welcome our newest Global Chair, Professor Ramsés H. Mena, who is not only a world leader in non-parametric Bayesian methods, but also a University of Bath alumnus. Professor Mena has extensive experience, both in statistical research and of impactful projects in the area of natural disaster funding. The knowledge and insights that he will bring to the University during his time here will undoubtedly be invaluable. During his appointment, Professor Mena will be working alongside Professor Andreas Kyprianou and his colleagues at the Department of Mathematical Sciences and the Institute of Mathematical Innovation. We are very excited to have Professor Mena join us. During his tenure as a Global Chair, there are a number of opportunities we will have to benefit from this through SAMBa and IMI, starting with developing an expansive joint project looking at disaster modelling together with industrial partner Willis Tower Watson. Professor Mena’s visit also marks a point in time when the relationship between Bath and UNAM is ready to move forward to explore much deeper collaborative opportunities across campus between the two institutes. Ramsés first public lecture, entitled Statistical Methods for Natural Disaster Risk Assessment, and in which he will discuss the importance of statistical and probabilistic methodologies for the risk assessment and financial management of natural disasters, will take place on Friday, 30 November 2018. All colleagues are welcome to attend.